I realize things are pretty tight here...had power lines above, road below and to the right, a bunch of unsightly crap to the left...so I took what I thought was the best available perspective. Use of HDR was to open up some of the dark areas of the barn, but tried to minimize the impact...hoping it doesn't look too much like an HDR. What think thee? First of all, you can never shoot too many barns! They are an excellent subject imho. I would have to agree that the composition is lacking a bit on this one.. it just doesn't tell the viewer much about the location. I also think there must be a number of better angles you could use of the barn itself; I'm thinking low and up. The HDR looks Ok to me, but more mystery/verboten would work better. Gorgeous. 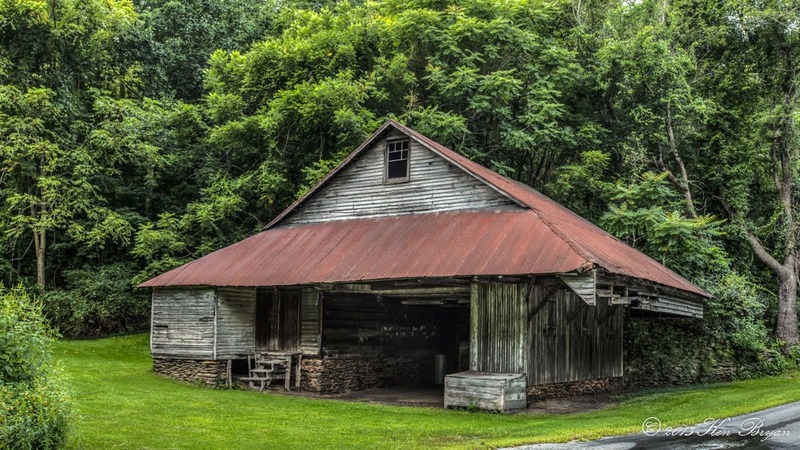 I love the use of HDR here, I think it really brings out the contrast between the greenery and the old barn. My first thought when I looked at this was: "That's not Montana." I like it. I love the way the barn pops out from the woods. It is still a bit HDR-y for my taste. It has more of an illustration feel than a photo feel to my eye. But that's really a matter of taste. And the HDR doesn't by any means ruin the image for me. That barn and the scene have too much character. I see what you mean about the composition being a bit tight. It would be nice if it was a bit more open. But sometimes you just have to take what you can get. The other option is to use the extraneous elements as part of your composition. I find myself doing the same thing you did here - trying to remove everything that I feel doesn't belong. On the other hand, those things are there, so they do belong. It's really a philosophical question isn't it? Are you taking a picture of what's there? Or are you trying to building a fantasy based on what you see? @GB I'm sure other perspectives were available to photographers with a more open-mind than I have! Often I find I need to really push myself into an uncomfortable place in order to "see" those opportunities. The main reason I used HDR here was to reveal more about the barn's interior, because from a western US perspective this would be an odd structure, begging a number of questions. @PJ The "not Montana" is what caught my eye here, for sure! The line between a hint of HDR and too much, seems to be pretty narrow. I need to practice not crossing that line more. My intent of the composition was to create a timeless image, thus including surrounding objects of a different era than the barn would be counter to that objective. At the same time, had I taken a few shots that were inclusive, I could have used the image to tell a different story - one that I can't tell now. Seems like I might have a little stingy carry-over problem from the film days when those "extra" shots cost money! Seems to apply to photography as well as hockey! I just may add this to my signature!